ORLANDO, Fla. (AP) — Former Republican U.S. Rep. Ron DeSantis put his thanks squarely where it was due after declaring victory in Florida's governor election: with President Donald Trump. 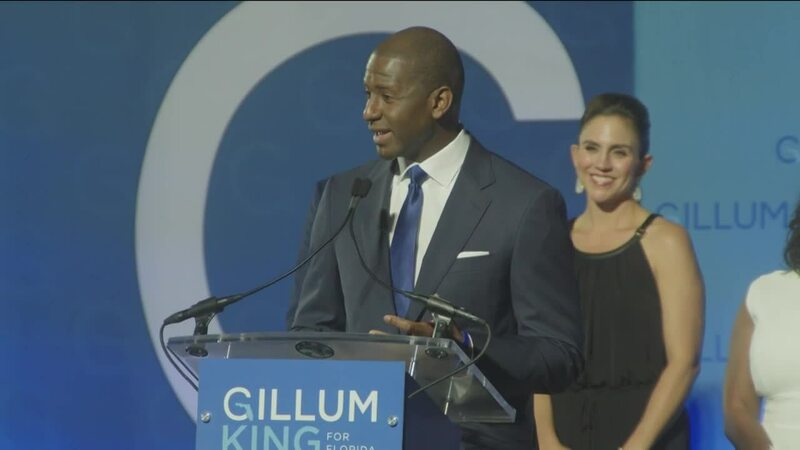 He said Trump's support made all the difference in his defeat of Tallahassee Mayor Andrew Gillum, who was hoping to be Florida's first black governor and the first Democrat elected governor since 1994. "I'd like to thank our president for standing by me, for standing by me when it wasn't necessarily the smart thing," DeSantis said after the vote count gave him the edge. "Mr. President, I look forward to working with you to advance Florida's priorities." Trump tweeted his congratulations early Wednesday: "Ron DeSantis showed great courage in his hard fought campaign to become the Governor of Florida. Congratulations to Ron and family!" Republicans have now won the governor's office six consecutive times. The Capitol will enter its third decade under complete Republican rule when DeSantis takes office in January. Gillum trailed by about 1 percentage point and fewer than 80,000 votes when he conceded. He had built a lot of enthusiasm around his campaign and led in most polls leading up to the final week of the election. But that's when Trump came to Florida — twice — to boost turnout for DeSantis. Trump, who carried Florida in his presidential win, also helped save DeSantis in the GOP primary, when he entered the race as an underdog against a better-known and better funded Republican opponent. Trump tweeted his support and held a rally, and DeSantis easily defeated Republican Agriculture Commissioner Adam Putnam, despite failing to lay out a plan of what he would do if elected. DeSantis, 40, said the "political and media classes" had been eager to write his political obituary. "On Election Day, it's the voice of the people that roars," he said. Election Day "is the one day the elites don't call the shots ... and they don't set the agenda." 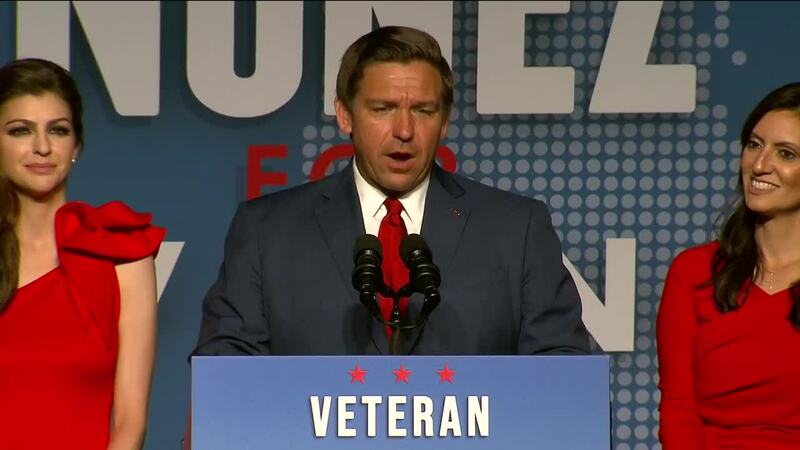 DeSantis presented himself as a political outsider despite serving three terms in Congress and running for U.S. Senate in 2016. He dropped out of that race when Republican Sen. Marco Rubio decided to run for re-election. "Ron DeSantis has made a career out of protecting citizens. He did it in the military, he did it as a prosecutor and now he will do it as governor," said Brevard County Sheriff Wayne Ivey. "We're excited to get this thing done. It's been a long political season." Gillum, 39, told his supporters he's not going away. "We have a choice to make tomorrow morning. Are we going to wake up and bask in sorrow and defeat, or are we going to get up and reassert ourselves to the mission at hand? Are we going to get up and fight for the things we believe in? Are we going to get up and say we still deserve our seat at our table?" He choked up a bit when he made reference to his campaign slogan, "Bring it home." "This was from the very beginning an extremely, extremely difficult task. I sincerely regret that I couldn't bring it home to you," Gillum said. "In four years, he'll be able to run again," said Cindy Martin, 50, of Pensacola. "Maybe 80,000 people will wake up and say, 'OK, we didn't vote the last time.'" "The polls might say the opposite, but Andrew Gillum really won. He set the tone for us as African-Americans to do certain things," said McClees, 18. "He inspired a lot of people, and he made a movement." DeSantis stumbled out of the gate after winning the Aug. 28 primary, telling Fox News that voters shouldn't "monkey this up" by electing Florida's first black nominee for governor. DeSantis angrily disputed that he's been racially insensitive during a debate. DeSantis told reporters after his speech that the most pressing issue he will address as governor is Florida's water problems. "I've talked to the president about this. He understands it. He cares about Florida," DeSantis said. "And I told him some of this infrastructure needs to get going ... It will be a top priority for me." This story has been corrected to show that Republicans have won six, not seven, consecutive governor races.